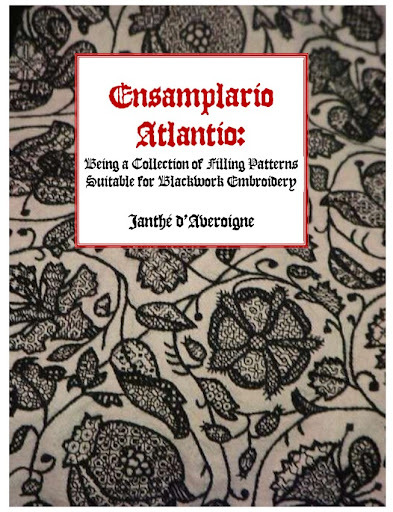 String or Nothing has posted a brand new free blackwork pattern book, Ensamplario Atlantio! It’s pretty cool – there are over 200 patterns in there. The patterns range from simple geometric repeats to stag heads and griffins. 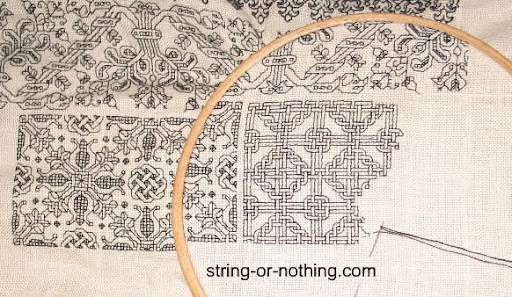 Anyway, if you have any interest in blackwork, it’s a fantastic resource. The bottom two patterns in the photo of her sampler below are included in the book. My favorite pattern, though, did not make it into the book – check out Dancing Pirate Octopodes!!!! This entry was posted in Blackwork, books, Free resources online, patterns and designs and tagged blackwork, embroidery, free patterns. Bookmark the permalink. I agree – they’re great fun. I’m beginning to wonder whether I can take the idea and develop a different set of motifs…. After vacation week I’ll put out a crowd-source call for additional motifs for Dancing Pirate Octopodes and post the ones submitted on String. This will be fun! I’ve been trying to fit it into every conversation! I prefer to pronounce differently from the video, opting for the more childish (read fun) sounding: “Octo-podies.” Is that a Flying Spaghetti Monster I see?! Yup. In all his noodly glory: http://www.string-or-nothing.com/2011/06/23/CHALLENGED.aspx Rendered in a particularly silly moment. Younger Daughter doesn’t have a British accent, but she can spout off the puses-pi-podes case ast the drop of a cephalopod.